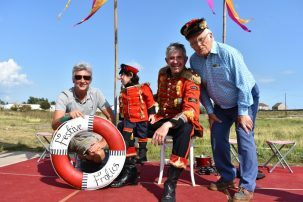 Resorting to the Coast partnered with The Grand Theatre of Lemmings who performed our Seaside Frolics show in August 2017. The entertainment programme showcased the history of seaside entertainment through street theatre, installations, theatrical re-enactment and the sharing of memories. 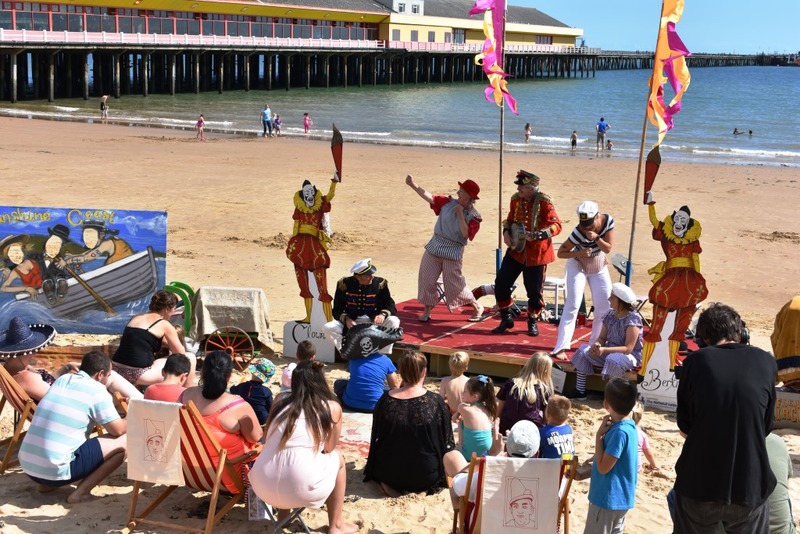 The show toured several coastal resorts of Tendring, including Clacton-on-Sea, Jaywick Sands and Walton-on-the-Naze. One very special entertainer was featured in the show – the fascinating Clown Bertram, our local seaside hero. 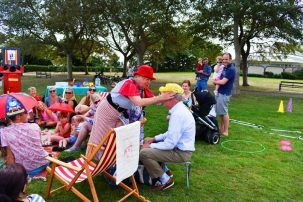 He was the most popular and best-loved performer ever to appear in Clacton-on-Sea and spent eighteen seasons from 1922 to 1939 entertaining both adults and children alike in packed houses. 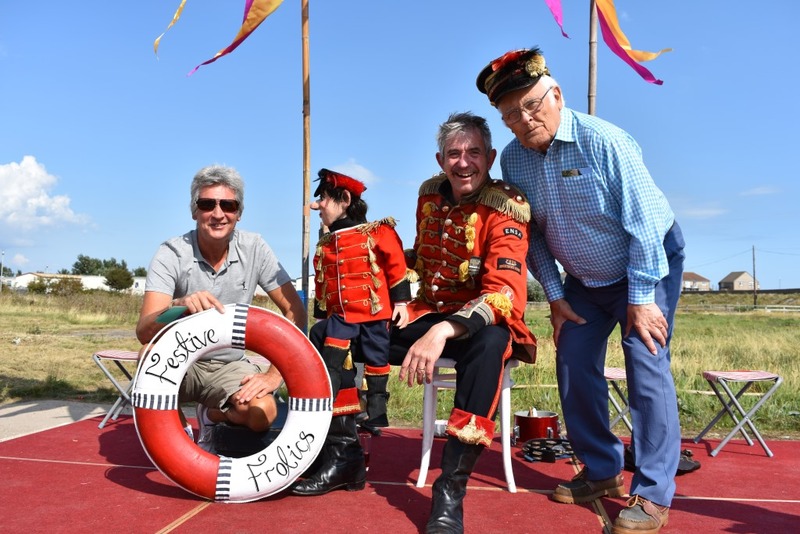 The famous ‘Filbert’ was making an appearance today with his ‘carer’ – the equally infamous Norman Jacobs, at the Martello tower (Jaywick) which hosted a day of events in his honour. (Filbert, that is, Norman attended in the hope some of the ‘charisma’ might wear off on him!) he was the long time companion of Clown Bertram and was recently acquired by the local history society (of which Norman happens to be the supremo!) 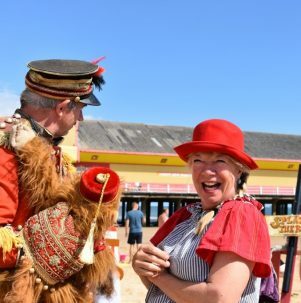 and as Bertram was nationally known for his links with Clacton, it was very appropriate that Norman should recount the story of this VERY special entertainer, from his humble beginnings, to his ascension into megalithic fame and popularity, mainly for his outstanding input with family orientated shows on the pier. Norman, as usual, gave a riveting talk, accompanied by images, which encompassed the life of this person loved and treasured by many. A visit to Clacton whilst he had his long running show, was a ‘must’ for any family — he was like a magnet, drawing his audience from all ages (although mainly a children’s entertainer) and many walks of life. Then, a talk by ‘Uncle Tacko’-suitably attired in ‘ringmaster’ uniform followed- his sheer enthusiasm and detailed knowledge of music hall matters was duly noted! Afterwards, we all went outside and were entertained by the members of The Grand Theatre of Lemmings. 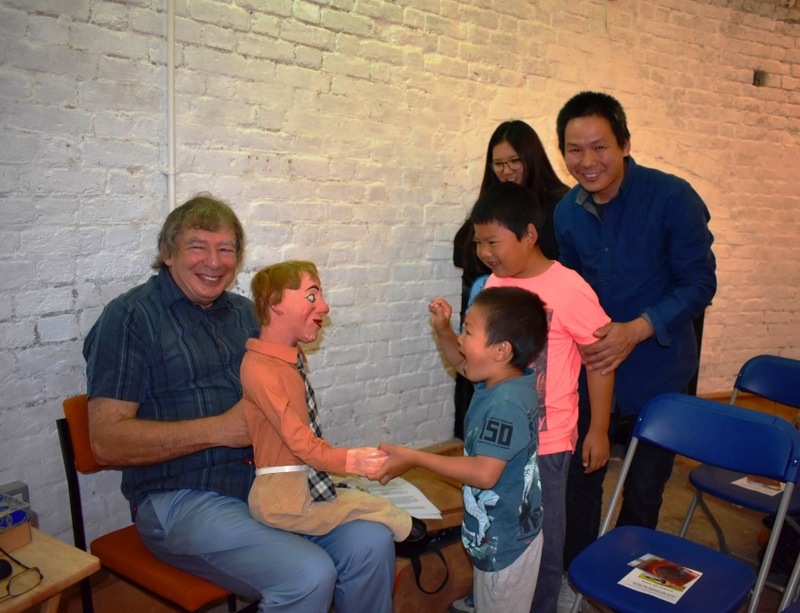 Every one of the troupe imparted unbounded enthusiasm and although we (of the older generation) had heard many of the ‘doctor’ jokes in the surgery routine, we still all laughed – memories for many in attendance of a life of innocence, which encompassed all areas! Uncle Tacko’s engaging patter, carefully honed to perfection over a prolonged period, encouraged audience participation – every single nuance a little ‘gem’. His sheer enthusiasm and quick repartee mesmerised his audience – this was truly entertainment that has endured many a year and will probably continue to do so. Plenty of cheeky banter ensued when we were introduced to the ‘flea circus’. Quite a few youngsters were in attendance and it was SO refreshing to see them abandon their mobile phones, in favour of this live endeavour. 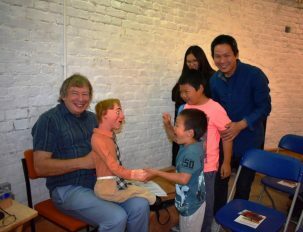 We enjoyed hearing their laughter – they were so engrossed and bewitched with this innocent form of entertainment which captured the imagination of their forefathers and has endured, most definitely for a longer period than some of the current offerings will! The event was also attended by members from the local council and representatives from the town hall. The mild, clement weather helped to make this a very special ‘al fresco’ event – apparently the first ‘outing’ for this particular routine.